Obituary – Price, Connie Ellen (Wentz) « Perry High School Alumni Association, Inc.
‘A’ Team Cheerleader ’64-’65, F. T. A. ’63-’66, Jr. Play ’64-’65, Red Hots ’63-’65, Christmas Vespers ’63-’65, All School Revue ’63-’65, Glee Club ’63-’65, Library Staff ’65-’66, Home Ec Style Show ’62, ’63. ﻿Funeral will be at 2 p.m. Wednesday for Mrs. Kenneth (Connie Ellen Wentz) Price, 27, Guthrie, formerly of Perry, who died of injuries receivad early Sunday morning in a one vehicle accident eight and one-half miles east of Hennessey. Services will be at the Guthrie Christian church at 1802 West Logan, with Rev. Steve Herndon officiating. Burial will be in Grace Hill cemetery at Perry under direction of the Abernathy Funeral home at Crescent. The body will lie in state at the Abernathy Funeral home until service time Wednesday. Born April 3, 1948, at Mann-ford, Mrs. Price lived most of her life. in the Perry area. 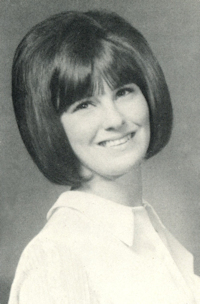 She was a 1966 graduate of Perry high school and had attended Oklahoma State university. She was married Feb. 1, 1974, in Texas, to Kenneth Price, who survives. She was a member of the First Christian church of Perry. Mrs. Price was employed by the Guthrie Job Corps, as a PBX operator at the time of her death. She had lived in Guthrie the past three years. Survivors include her husband, Kenneth, of the home; her mother, Mrs. Geraldene Wentz, Guthrie, formerly of Perry; a sister, Mrs. Bill (Sue) Vollmer, Perry; two nephews and one niece. She was preceded in death by her father, Tom W. Wentz.